US president Donald Trump may extend his visit to the UK in July in order to play golf in Scotland. The property magnate-turned politician owns two golf courses in Scotland, and one in Ireland. He was due to arrive in the UK after attending a NATO summit on 11-12 July, and the main focus of the trip will be talks with Theresa May on 13 July.It will not be a full state visit but Mr Trump is expected to meet the Queen.Downing Street previously referred to Mr Trump's July trip as a "working visit", after he previously cancelled a trip amid claims he would face mass protests. A formal programme for the visit has not been agreed by either country, though it has been speculated that Mr Trump may choose to meet the prime minister at her country residence, Chequers in Buckinghamshire.BBC North America editor Jon Sopel speculated in April that Mr Trump may meet the Queen at Buckingham Palace or Windsor Castle. It is thought Mr Trump may choose to avoid meetings in London, where he could be confronted by protestors. President Trump's companies operates golf courses in Turnberry and Aberdeen in Scotland, and one in Doonbeg in the Republic of Ireland. 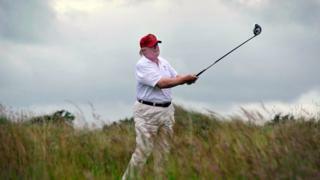 Details of a stay in Scotland have not been confirmed, but one option under consideration is for him to play a round of golf with a well-known professional player.While on the campaign trail, Mr Trump previously criticised former US president Barack Obama for the time he spent playing golf. The White House cancelled plans for the president to visit in January or February when it was expected he would open the new US embassy building in London.But he cancelled the opening of the building in Vauxhall, complaining the move to an "off location" south of the Thames had been a "bad deal". 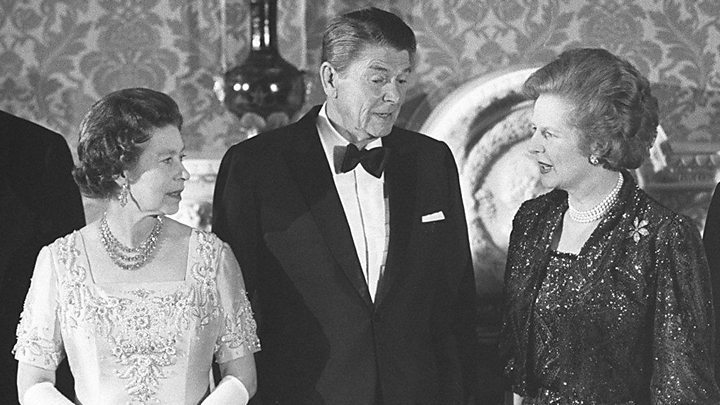 Theresa May was the first foreign leader to visit Mr Trump in the White House following his inauguration in January 2017.She conveyed an invitation from the Queen for Mr Trump to come for a state visit - a formal occasion with much pomp and ceremony.Mr Trump accepted the invitation but a date has yet to be set for a full state visit, amid speculation it has been postponed indefinitely.